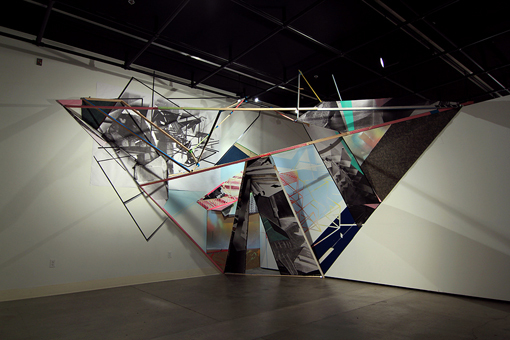 Eddie Villanueva produces compositions that excavate surfaces, occupy spaces and reverberate throughout environments. He maintains a democratic approach to creative exploration, giving himself the agency to mix and remix materials, themes and content into graphically structured groupings with dissonant surfaces. His aesthetic investigation is driven by critical engagement with mixed materiality, illusion and spectacle. Intuitively responsive to formal variables and attracted to emphatic composition and design, he looks for visual experiences that oscillate between incongruousness and harmony.